New Brunswick, N.J. – The Equine Science Center at Rutgers University partnered with the University of Minnesota in procuring blood samples from over 700 Standardbred horses in New Jersey and New York for a new group of studies aimed at identifying genetic factors underlying musculoskeletal diseases in horses. The studies will also look at performance traits, such as gait and speed, and how a horse’s genetic makeup affects these traits. Broken into four distinct studies, the researchers will examine the genetic risk factors for recurring exertional rhabdomyolysis (RER) and osteochondritis dissecans (OC/OCD), and will investigate modifying loci associated with trotting and pacing and those affecting performance in Standardbred horses. “Identifying the genetics contributing to OCD and RER will allow us to design better treatments and management recommendations for these horses,” said Dr. Molly E. McCue, Associate Professor in the Department of Veterinary Population Medicine at the University of Minnesota. “In addition, we hope that identifying the genetics that contribute to traits such as gait, speed, and elite performance will allow trainers, breeders, and owners of Standardbred horses to breed for desirable traits, select the best racing prospects, and train these horses to their fullest genetic potential,” she added. 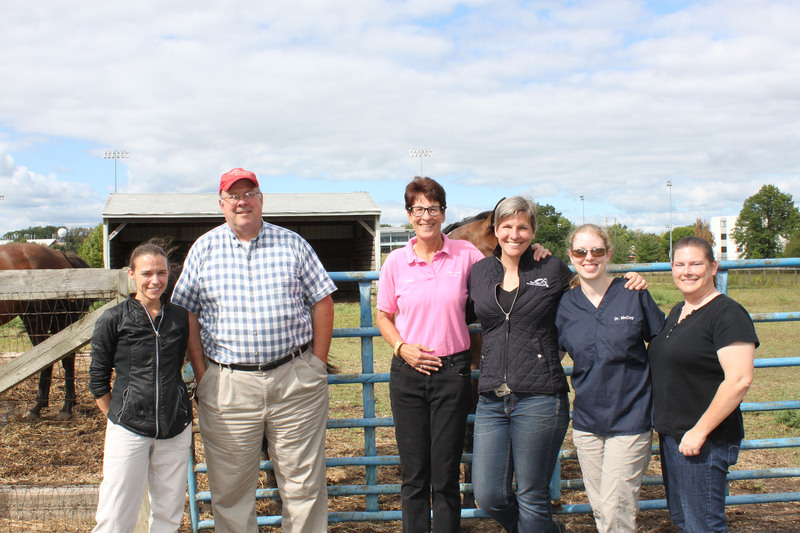 The University of Minnesota team met with Karyn Malinowski and Ken McKeever to take blood samples from the Rutgers Herd. (From Left to Right): Elaine Norton, Ken McKeever, Karyn Malinowski, Molly McCue, Annette McCoy, and Rebecca Splan). The sampling done in New Jersey took place at Gaitway Farm in Manalapan Township, Joie de Vie Farms in Jobstown, Winner’s International Farm in Chesterfield, and White Birch Farm in Allentown. Sampling was also done in New York at Split Brook Farm in Hurleyville and at Ray Schnittker Racing Stable in Goshen. After receiving the consent of either the owner or trainer, a 10ml blood sample (two purple top vacutainer tubes) was collected from each horse for the purpose of DNA isolation. A single sample can be used for any or all of the studies. Information collected at the time of sampling minimally included the registered name and/or tattoo number of the horse, gender, and age. Phenotype for RER and OC (affected/unaffected) and gait (pacer/trotter) was noted based on client consent. Sampling in New Jersey and New York took place from September 10th to September 13th, and will be added to a larger sampling conducted by the University of Minnesota team. Because of the overwhelmingly enthusiastic support for the project by harness racing trainers in the area, the team will make a return trip in early 2016 to continue sampling. The first results of these studies should be available in a 12-18 month timeframe. The mission of the Equine Genetics and Genomics Research Group is to use advanced genetic and genomic technologies to improve our understanding of equine health and biology.